Now that Samantha Sweet has a contract to provide her special handmade chocolates for the wealthy jet-set clients of Book It Travel, Sweet’s Sweets bakery is taking on a whole new dimension. Only problem, Sam isn’t ready. It’s almost Halloween, and her pastry shop is bursting at the seams. She needs extra employees, but there is no place to put them. Right before the witching day, she comes upon a large Victorian house she can adapt for the business, and it seems her problem is solved. But is it? The mysterious, spooky noises at night are way more than the normal creaks and groans of an old building. Something else is going on, and Sam suspects it may be related to her husband’s newest case, investigating where an abandoned duffle bag crammed full of cash came from. Beau is dealing with a greedy reward-seeker, a robbery with no leads, and a waif who appears and vanishes. Sam’s mystery has her watching for ghosts and working almost around the clock. Is she relying on magic? Well, occasionally. 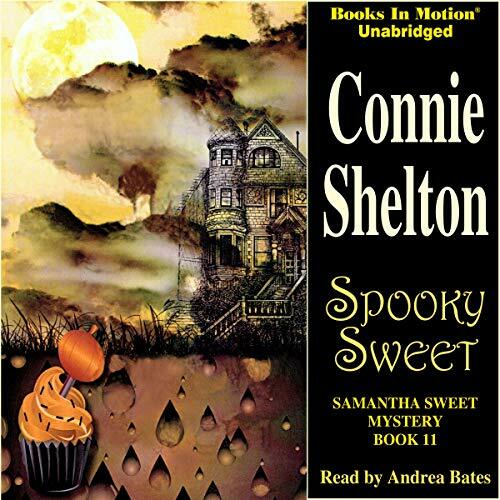 Spookey Sweet is my first read of this series. Great narration makes the story compelling and tough to put down. Main character Sam is a well developed figure and holds the story line together well. Other minor characters blend in quite pleasingly. Love the mystery component and appreciate how the author spun the tale without crass language. This is a series I’ll want to explore further! Another fun mystery with Samantha Sweet! I hope there will be another one soon ! I saw this book in a add and it looked like it would be good. It was. I enjoyed it. I loved how it started with a bag of money left in a restaurant that turned out to be apart of a robbery of an armored car, Samantha looking for a place for her chocolate making and finding a old house to turn into her new shop. While she is trying to get her new shop ready, Beau is looking for the robbers and not having good luck. Will he find the killer? Will the new shop work out for Samantha? I do look forward reading more in this series.